GD1895 was successfully added to your cart! GD1895 could not be added as a favorite. Please make sure you are logged in. Needham V8 Ag Firming Wheel, 10" diameter green urethane tire. Case-IH SDX30, SDX40 air seeders; 30, 40 Precision Disk drills. Original wheels are too wide to fit into the seed slot correctly. Needham V8 Ag Firming Wheel has a special narrow profile and design that matches the shape of the seed slot. 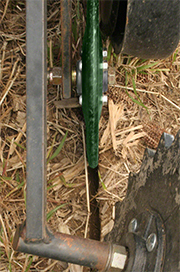 Narrow profile allows the tire to correctly push the seed into the bottom of the seed slot. Includes heavy duty double row ball bearing for extended life. Mounts to the existing press wheel arm. Hardware included.